Get Involved: donate, join, participate! | C. A. M. P.
Get Involved: donate, join, participate! CAMP counts on community involvement for its success. 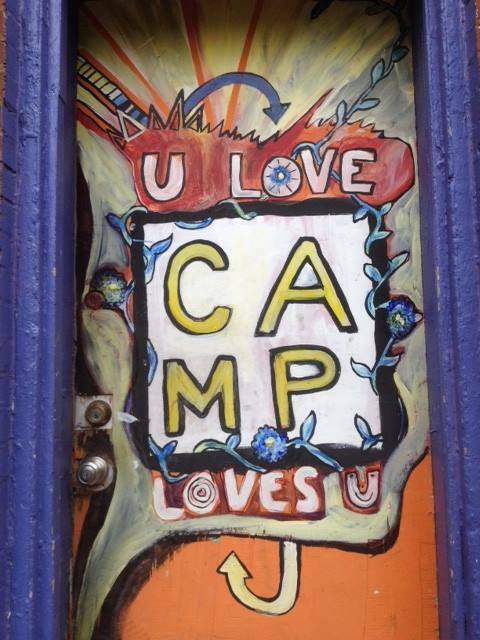 From its beginnings, CAMP has been a membership organization that depends on community volunteers, donations, time, and energy. Explore the links below to find a way to become involved in CAMP that suits your needs and interests! We are an open community center for the arts and culture aiming for a better world! CAMP solicits funding from a variety of sources, including earned income, membership fees, grants and donations. CAMP Founding Members offer monthly donations to sustain CAMP's operational costs and fund new initiatives. Please give though our Network for Good account using your credit card. We are a verified charity through Network for Good, and you will receive an automatically generated tax deduction letter. If you want to talk about setting up an ETF from your bank account, donating a large amount of supplies or furniture for tax purposes, leaving us money in your will, or anything else you can think of that's not listed here, please feel free to contact us. The CAMP collective is the engine of all CAMP activities. Collective members donate their time, ideas, energy and enthusiasm to CAMP by attending monthly meetings and adding value to the organization. Join the CAMP Collective! This will give you regular access to our facilities, our event space, and much more! CAMP Collective membership costs only $60/year, and you will become part of the process of neighborhood renewal occurring right now in our community! See our Membership Packet to learn more about joining the collective and become an active member of CAMP today! Join as a Program Facilitator: CAMP has brought a variety of classes to the Cherokee Community including yoga, weaving and capoeira. If you are a community educator or aspire to hold programming at CAMP, please consider completing a CAMP program proposal today. CAMP offers a variety of ways to participate in activities. Events and classes bring life to the building, volunteer projects bring needed improvements to our organization and your participation is what CAMP is all about! Attend a CAMP class or program. A variety of classes are offered at CAMP and offer participants an affordable way to get engaged with the community, get in shape and learn new skills. If ther is a class you would like to see at CAMP, let's work to make that class a reality. Attend a fundraising event or help plan one. Check the CAMP calendar for upcoming events or come to a general CAMP meeting on the first Tuesday of every month, at 7:00 pm at the building. You can receive email notifications of upcoming events by typing your address into the "Event Announcements" box in the right hand column of the main page and click Subscribe. Plan a Service/Learning project. We are always open to hosting groups that want to spend an afternoon doing volunteer work. We can come up with a plan for you, or you can let us know what you are interested in (light construction and rehab, gardening/planting, bike repair, neighborhood cleanup, etc). Organize an event, conference, rally, or class! We thrive on using the community center!